Frost Factory - Tropic Freeze 100mLA frozen symphony of tropical kiwis and strawberries.VG/PG: 70/30.. 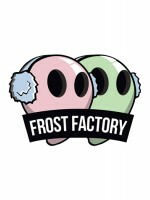 Frost Factory - Ice Chee 100mLJuicy Lychee and exotic fruits with a refreshing menthol finish.VG/PG:.. Frost Factory - Crisp Apple 100mLSweet crisp apples blasted with a menthol chill.VG/PG: 70/30 A..